Grand Flowers basket comes with 75 Red & white Roses and 20 purple Orchids nicely arranged in a tall basket with lot of green fillers, 5Kg Vanilla / Butterscotch Tier Cake without cooling .This arrangement can fit any occasion including Birthday, Anniversary , Wedding Day, Retirement ...etcIn our Grand Flowers-Cake combo, our expert florist has put together 75 red and white roses and 20 purple orchids in an awesome flower basket. The green fillers have been added extensively and they make the flower basket a treat for the eyes. This lovely flower basket comes with a two tier cake and you get to choose its flavor from Vanilla, Strawberry, Pineapple, Butterscotch, Chocolate and Black Forest. Send flowers online with the delicious cake to your loved ones on happy occasions. 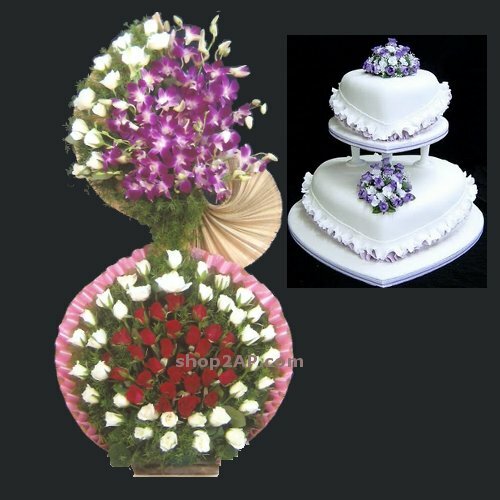 You can send Grand Flowers-Cakes on weddings, anniversary, birthdays, retirement, graduation and other joyous events.